Michele Bachmann is a very new kind of American politician – one who seems to have nothing but contempt for politics and for her political opponents. For Bachmann, and her Tea Party fellow travelers, there is only one RIGHT WAY and there is no longer any need to examine mature alternatives. We can thank the Tea Party for the creation of this new kind of American candidate: a candidate who runs for government office whilst simultaneously hoping to completely dismantle all functioning democracy. Last week's US credit rating downgrade was just the beginning, because these are candidates who prefer crisis to compromise. You'd all better get used to hearing the word no. Politics used to be the art of the compromise, but for the GOP these days compromise means a quick demotion to the also-ran's. Thank the Inquisitor General of talk radio Rush Limbaugh for that, he will not suffer a heretic and he maintains the climate of dread. Thanks to him and his fellow travelers at Fox News, we now live in a hardline era of far-right ideological purity tests and pledges. It's an age where candidates must sign up to out-oppress all unfavored minorities - or they'll be forced off the stage. So Bachmann, like her other far right cohorts, no longer troubles herself with the idea she represents all the people - there's no need for pretense anymore - she is instead pandering shamelessly to her white, evangelical midwestern and southern base and if elected she would only represent them (because for her there is no other American viewpoint to examine, and no need for further consideration at all). It's bad enough that some of the Minnesota electorate put this absurd candidate (Bachmann actually thinks that the Renaissance and the Enlightenment were disasters for humanity) into public office, but it's unthinkable to put an ignoramus of this magnitude into the White House. This is a woman who's husband touts (and reportedly practices) quack ex-gay therapy. Bachmann has also called for the reinstatement of Don't Ask, Don't Tell. These anti-gay perspectives aren't sideline issues: they are absolutely definitional. 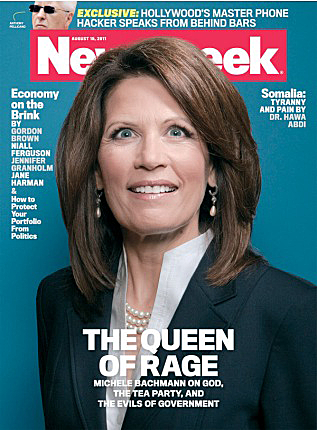 The Bachmann's both believe the gays hail directly from the Devil and are under his baleful rule. Please read that previous sentence again. That kind of abject lunacy would be fine if this were AD 1011 instead of AD 2011. But as it stands, they're a pair of ahistoric, backwoods theocratic zealots who can not and will not countenance the modern world. Whilst decrying government spending it's interesting to note the Bachmann's were very happy to take government bucks to 'pray away the gay' at their 'clinic.' That's why just yesterday on NBC's Meet the Press, host David Gregory asked her to reply to her utterly infamous 2004 comment that being gay is 'part of Satan.' Bachmann sat there not blinking until she eventually remarked, 'Well, I'm running for the presidency of the united states; I'm not running to be anyone's judge.' Oh please, what nauseating hypocrisy - calling gay people agents of Satan is what else? In 2012 we are being asked to trade hope and change for a brand new era of fear and repression. The Bachmann's apparently like the Dark Ages so much they're prepared to take us all back to them spiritually, economically, culturally and politically. But Bachman hasn't figured it out - it's dictators who never compromise - politicians are elected to. She's running for president, not Queen.